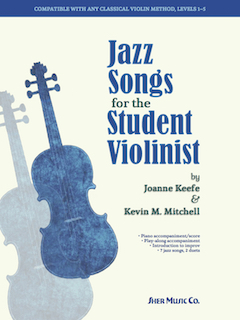 Jazz Songs for the Student Violinist by Joanne Keefe & Kevin M. Mitchell | Sher Music Co.
compatible with popular classical violin methods. The perfect violin supplement book to spice up your recitals while exposing your students to jazz! 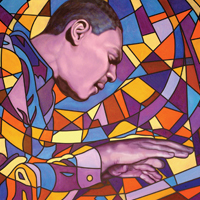 Includes standards such as “Ain’t Misbehavin,’” jazz classics such as Horace Silver’s “Song for My Father,” and “Orange Colored Sky,” which Nat King Cole made famous. Violin instruction for each song is pedagogically compatible with popular classical violin methods. At least one piece for each 1–5 level, including two duets - and there’s even a jazzy Christmas medley. Note-for-note piano accompaniment and score written out for each song. Audio recording by master violinist and jazz recording star Jeremy Cohen (of Quartet San Francisco fame) performing each piece to piano accompaniment. Piano accompaniment-only tracks also included for students to practice to. Simple, easy to understand introduction to improvisation section allows students to explore basic jazz concepts - invaluable! © Sher Music Co. All Rights Reserved.